Boho designs are a very fun and eclectic style to play around with as they use billowing fabrics, funky patterns, varying textures and various quirky decor. 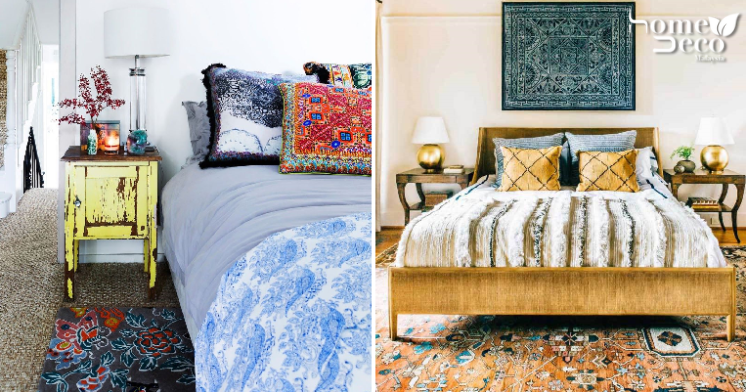 Turn your bedroom into a bohemian haven with a few of these gorgeous and playful looking styles that will make it look relaxed and inviting. Tapestry makes a beautiful addition to this bedroom and is a great focal point that adds an interesting layer. The big window lets in plenty of natural light that highlights the funky bed patterns and fresh plants. Create your own magical haven in your bedroom with the use of some twinkling fairy lights and deep, earthy tones. Hang a fringed scarf on the wall for added flair to match the quirkily patterned bedding and you will find your bedroom transformed. If you’re thinking that bohemian style only uses dark tones then you’ll be surprised to know that using bright and light colours work really well too. You just need to make sure to use distressed prints and seasoned colours for that easy and eclectic style. Combining two styles into one produces a really beautiful effect just like this bohemian and rustic bedroom. Using distressed wooden furniture paired with warm, earthy tones, the awesome looking prints are interesting and inviting. Another stylish and classy example that marries two styles together is this elegant modern and bohemian style. Deep, vibrant tones of emerald and cranberry in the bedroom meshes together with boho prints. Bet you didn’t know that floral prints could be bohemian too! Bright and colourful prints add a playful vibe while still making it stylish and gorgeous. You will find that mixing different patterns actually creates a very bohemian vibe in the room. Ever since she was young, Candyse has always loved to read about anything and everything. But when not doing so, she can be found exploring the world. What Happens When We Get Goosebumps And Why?